One Star House Party is a traveling pop-up restaurant held inside of unique Airbnb spaces. So far this year, they have hosted events in Hong Kong and New York City, with San Francisco taking place on April 26th through May 1st. "We took a big risk starting with New York. We know how competitive it is." "Finding the venue is such a huge part. It really comes down to the character of the building," says chef Kevin McCrae. 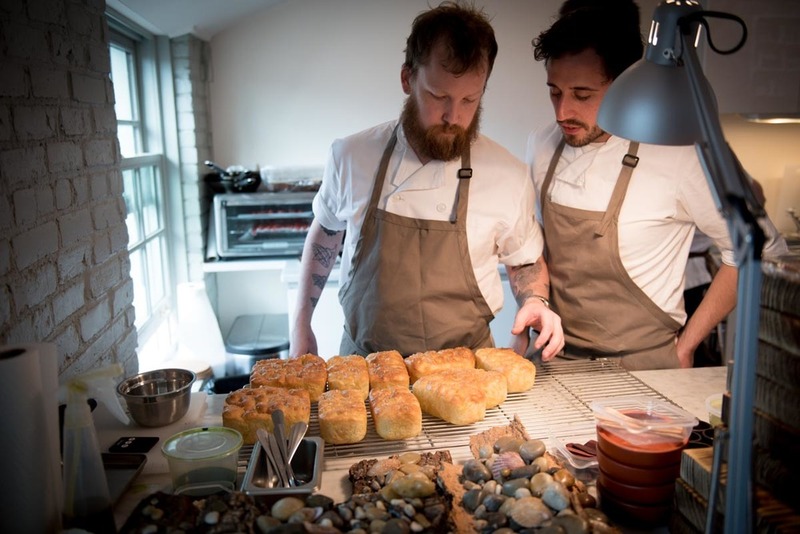 James Sharman hand-picked his band of chefs, "Stu is the level-headed one and is really great on pastry. As long as you don’t play too much of The Smiths, he is fine." The New York dinner took place for one week in the penthouse apartment of a West Chelsea townhouse. One of the challenges for Sharman and his crew is cooking in a non-professional kitchen. "This little kitchen has a tiny household oven, no extraction, and a tiny three-burner Smeg stove." 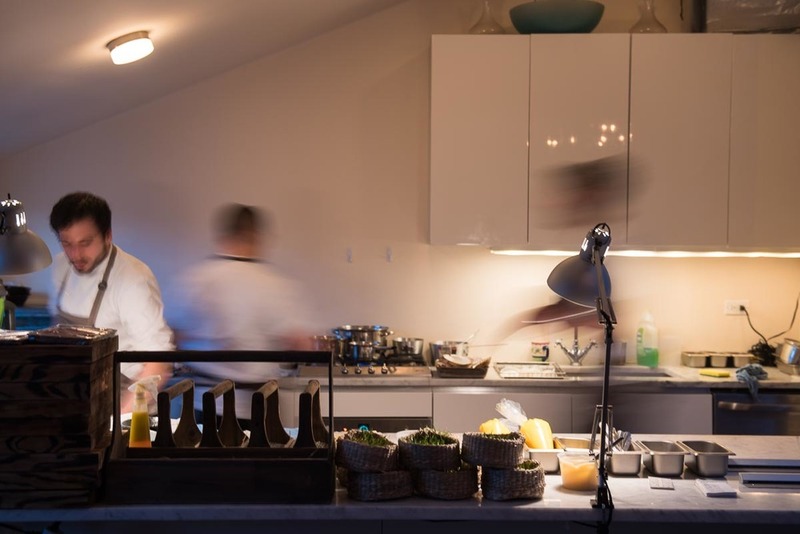 For Sharman, he feels that cooking in an apartment forces their creativity, "We are challenging ourselves to come up with new dishes under the constraints that we have here." Sharman calls this his dream team, "It is a team that no restaurant would ever sustain. 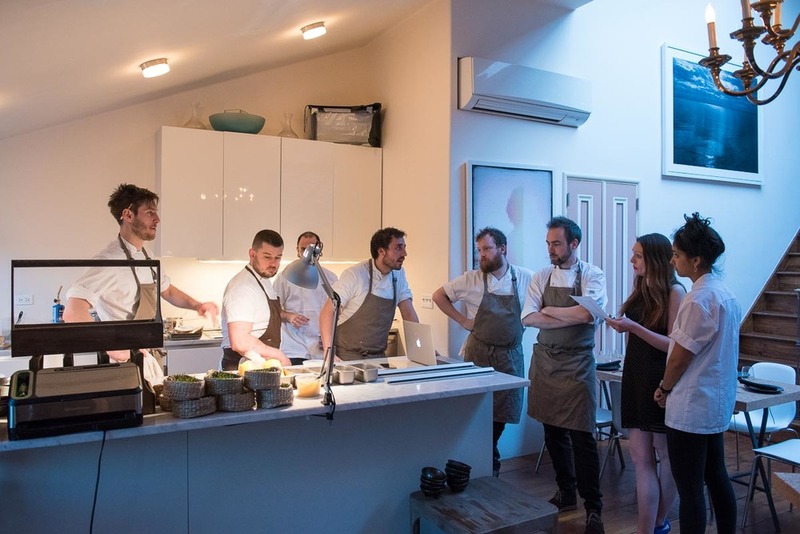 Only something like this could have this many talented people in a small space to cook for such few people at such a high level." The dinner features seven courses, including two desserts. 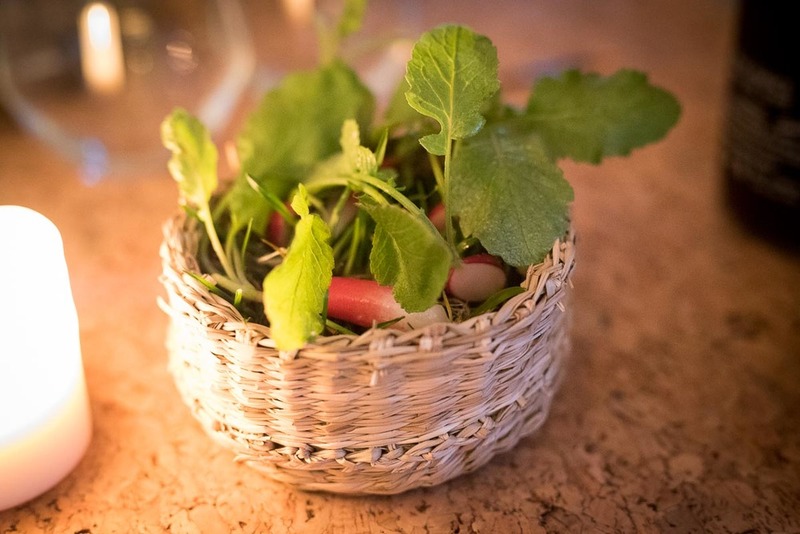 The opening course of baby radishes served in a straw basket filled with grass. You dip the radish in a salt cod cream with shavings of smoked cod roe. You bring your own wine and stay as along as you like, since there is only one sitting. Each course is brought out by a different chef who explains the dish. Tear off a piece of the house-made focaccia, dip it into the house-made ricotta, add olive juice, and top it with the tomato charcuterie of sliced, raw, and oven-roasted tomatoes. 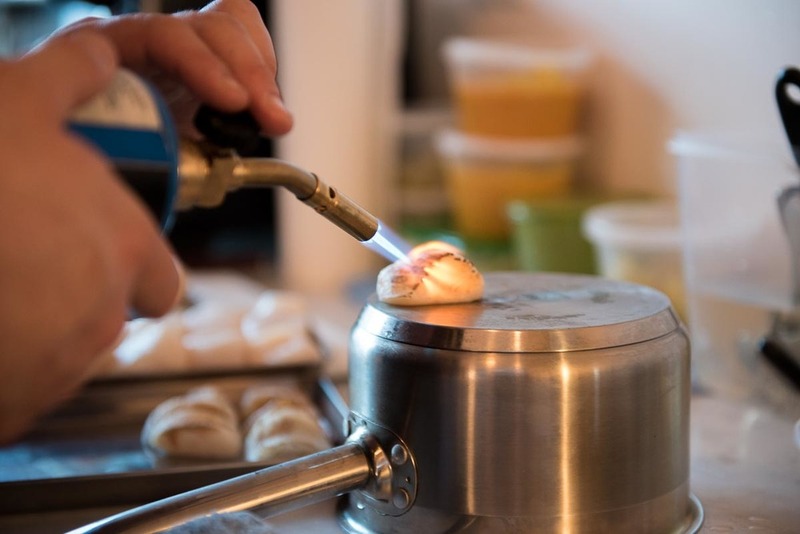 The scallop is seared using a blowtorch. 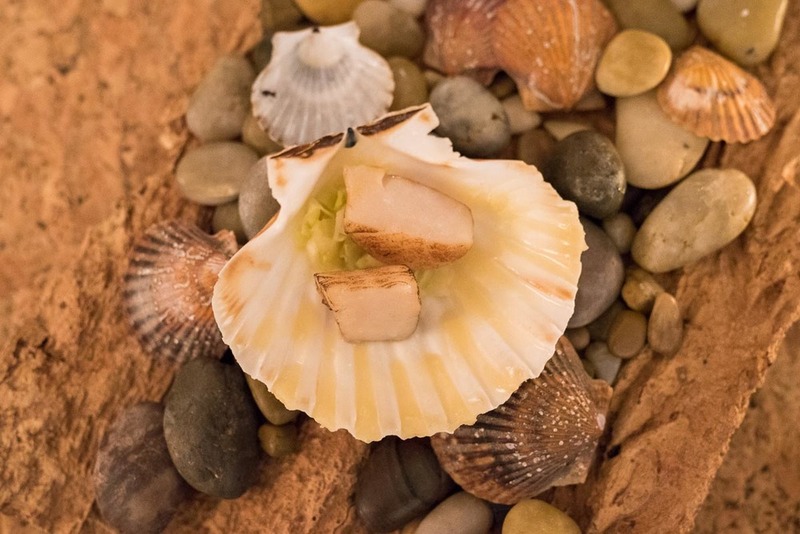 Scallops with beeswax fudge, leeks, and whey served on a bed of seashells. Chervil velouté and egg yolk fudge. A barnyard chicken and egg brought to you in a wooden case on hay. Their answer to the chicken and egg questions is they arrive as a pair. Dip the chicken into the egg dish. McCrae says the one star is a bit of a dig to Michelin, "We are not really taking it too seriously. You shouldn’t feel like you are in a restaurant. We want you to feel like you are in our home." Pumpkins are filled with miso-smoked pumpkin puree, beef short ribs, and pickled pine nuts. A chilled coconut is the first dessert filled with pickled strawberries. 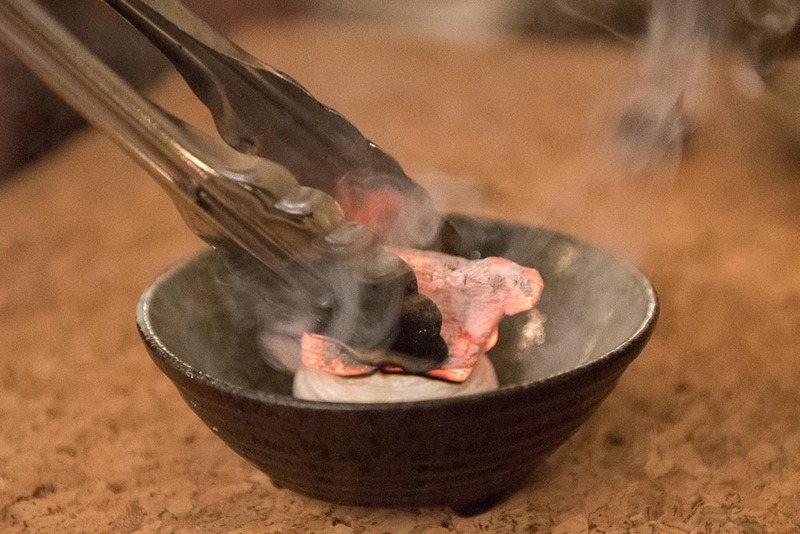 A hot coal gives a smokey, toasty flavor to marshmallow for the last course. Make your own s'more with the warm marshmallow, house-made granola, and a chocolate brownie. Photo Credits: ©Find. Eat. Drink. The project is spearhead by chef James Sharman, a protégé of chef Tom Aikens who has restaurants in London and Hong Kong. He was also the chef de partie at Noma in Copenhagen. His partner is chef Kevin McCrae, who also trained under chef Tom Aikens. The traveling crew is made up of a band of chefs whom they have worked with in the past. McCrae says their goal is to take the pop-up dinners to the cities they've always wanted to visit, "It is not like we have a complete set plan. 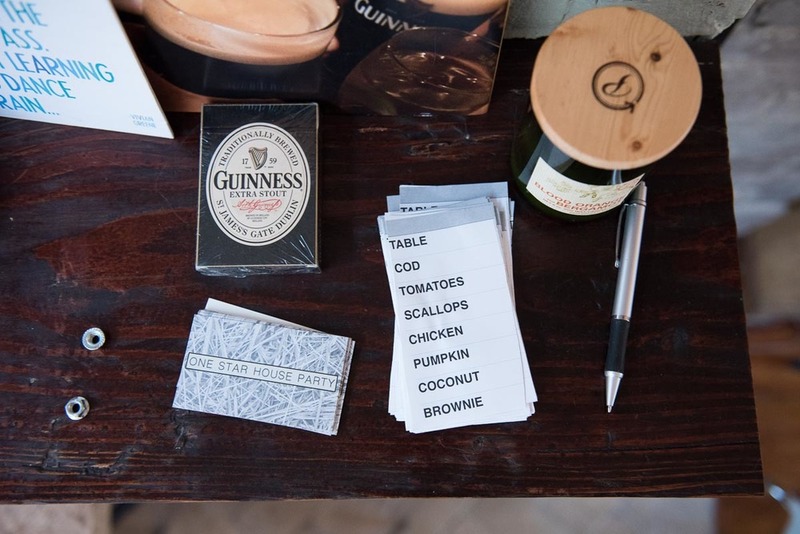 We will literally do this anywhere as long as we think that our food will go down well there." After working the line in high-end restaurants, the two chefs were ready to take their show on the road. "We wanted to showcase our own cooking and break away from what we were doing. We didn’t want to work for people in restaurants anymore." "We have all done the usual restaurant routine for about a decade now," adds Sharman, "you learn loads in a short space of time. But nowhere near as much as you do traveling around and seeing things the way we are doing it at the moment. Everybody wants to travel and we found a way to make it work." The menu will vary in each city, based on what's available in the local markets, but they will carry some dishes over from the previous city. "We don’t want to get too much into a routine," says Sharman. "I like it when it is a bit hairy and when people can see us being like that. It is rugged and it is raw." The name One Star House Party is a reflection of their goal to make it feel like a dinner party at someone's house. "The one star is a bit of a slight against Michelin," laughs McCrae. "We are not really taking it too seriously. We have been used to all these rules in restaurants. You have eat this way. You have to use this cutlery. You are supposed to behave in a specific way. We are trying to break down all of that. It is just about the food in a cool location. There are no waiters and waitresses. We do everything ourselves. Everyone is a chef, extremely highly trained, and they are here for a reason." Dinners are seven courses for $125, which includes tip. It is BYOB. Currently the cities they have planned are San Francisco, followed by Taipei, Tokyo, and Rio right before the Olympics. They also also hoping to add Seoul.